At my work it’s not uncommon for a nerf gun war to break out suddenly. Some of us have gotten into the habit of bouncing darts of walls, ceiling and other objects. Sometimes they land in things like coffee or lunches or the toilet while some one is taking a pee. Nerf is a Dangerous game. So on the weekend you may have noticed the site was down and out for a couple of hours. Well obviously it’s back. The issue has bee resolved and it was NOT A HACK. Just a timed switch was flicked off. we flicked it back on and put a sign over it. There must be some extreme nerfing going on in the background. That was the layout department. They’re always bringing in things. I tried starting a nerf thing here at work, but HR told me the USB surface to air nerf missiles just made coworkers uncomfortable. Conceal and utilize pee darts. Make them learn to fear you. 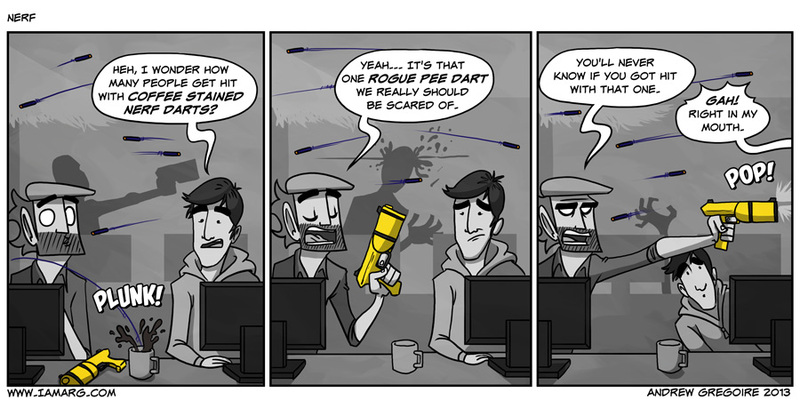 Pee-soaked nerf darts, the next generation of office biological warfare. Also, remember, always go to the bathroom armed. I like how that one guy in the background got his brains blown out by a nerf dart. It must have had a toothpick stick in the end of it. I was wondering, you talk a lot about your work but I can’t tell what you do in your work. Do you help with animations? Drawing? Or a regular office job? I’d bet anything it’s corpses. “At my work it’s not uncommon for a nerf gun war to break out suddenly.” I am so jealous of your life. I once had a half-dozen friends go to a starbucks with nerf guns, and started an amazing fight. Coffees were spilt, laptops were rushed out, and two of us were fined…. Ah yes… At Rhythm & Hues many people proudly displayed their Nerf weaponry. Ironically enough, most of them were all Tech Animators… hmmmmmmmmm. Nerf guns? What are ya wimps? Real office wars use piss-filled super soakers. Sounds like he works at Ubisoft from what I’ve heard from a friend of mine… Apparently they give a Nerf gun to everyone on their first day. Don’t bring a gun to a nerf fight. It’s over way to fast. Nerf headshot in the background.